One aisle, two server racks are the easiest and most common small data center enclosure. The aisle can be contained to a hot aisle or cold aisle layout, depending on the placement of the backs of your server units on the racks or cabinets. This system is easy to install and modular in design. The enclosure can be self assembled and removed, offering you flexibility on the placement and use of the enclosure. Two aisle server racks typically require a more specific air flow managed approach to a data center design. Since the rooms are larger, the relative placement of the AC units and duct returns are important and will best determine how an enclosure is designed. There are many options in the way the panels are mounted to a bracket system, what type of doors work best for the enclosed area and how the air flow patterns are directed to ensure proper cooling and ventilation. Our data center containment products provide an easy and effective way to create data center enclosures that help to protect server units from overheating. However, we do not provide any HVAC or CRAC equipment necessary to facilitate cooling or establish air flow patterns in a data center enclosure. AmCraft air management products are designed for your data center layout to be flexible enough to accommodate expansion in the data center server area, or to isolate smaller areas to better moderate separate air flow patterns and temperature variances. Our data center design and layouts provide a visual realization of your final data center room expectations before you order or build your enclosure. 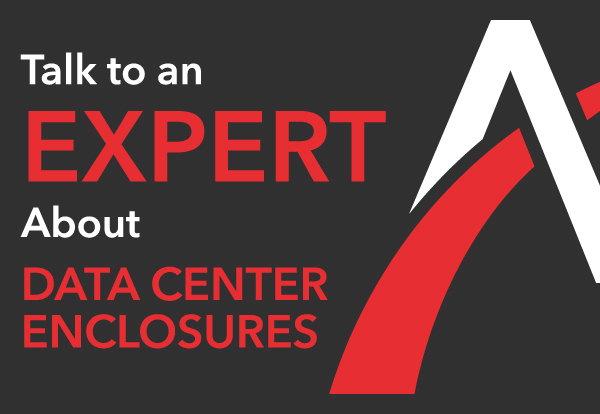 Data Centers come in all sizes and configurations but the objectives remain the same, to manage air flow patterns to move cold air through the server racks. The best place to start in the design of your data center enclosure / air flow arrangement is to make a dimensionally accurate sketch, taking careful note of the size and location of the input air points. Then, by using the core logic of aisle containment / server cooling, try to visualize ‘an arrangement’ placing cooled air at the front of the server rack, allowing the back of the servers to be placed outside of the contained aisle. The configuration of the data center design and layout are not only for optimal functionality, but should convey your company statement as well. AmCraft’s air flow panels are typically clear and the mounting hardware is nearly invisible. It does not have to look like a manufactured site, it can have the look of a high tech and clean design preferred by computer users. By design, the clear panels and aluminum mounting hardware convey the look of a modern, clean, cool and well lit space. At some point the capacity of your CRAC / HVAC unit relative to the generated heat load should be assessed. The results of the assessment will help to determine the best options for successful cooling. No amount of air flow management will keep your equipment safe if your cooling capacity is not in line with the generated heat load as compared to your desired set points. You may want to connect with an HVAC contractor who has experience with server room cooling. Copyright © 2019 AmCraft Manufacturing, Inc. All rights reserved.